Since it's a Sunday and I'm home being lifeless, I thought I'd pop over for an early update of my Day 9 to the 30 Days Challenge I am currently in. In fact, this could just be one of my favourite days to write about because it says to talk about "My favourite book". I'm not sure if many people know but I am quite a bookworm sometimes. I could just curl up into a ball and hit play on my then MP3, now iPod before I try and finish up a single novel. My current obsessions includes books that are placed under the non-fiction section that talks about pains of growing up or anything like that (Richard McCann writes a good book at that) and if they are indeed of fiction, they must include elements of family matters that have deep dark secrets along with a little bit of law enforcing action into it. Think Jodi Picoult or Diane Chamberlain. In fact, I have been so in love with Jodi Picoult books that I became pretty sad to know there weren't anymore for now and resorted to finding Diane Chamberlain by luck at the Big Bad Wolf Books Sale 2012. However, as much as I am obsessed with books from these categories, my favourite book is in fact NOT anything like those. 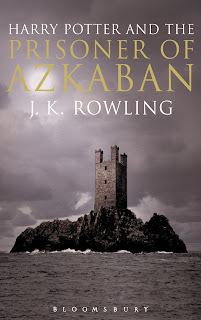 It's something that I think may get most of the people interested and probably some people telling me that it's theirs as well because it is none other than a work by J.K Rowling. No kidding, this is my absolute favourite. Some people may ask why is it that I have become so specific when I have the whole series to talk about? Well, I don't quite have the answer to it. I remember getting my copy for about RM 49.90 from Carrefour, Midvalley Megamall and that alone felt pretty pricey for a young child like me but my parents have always fostered the love that I have for books and never minded that I wanted to spend so much on something that I could sit and read about. In fact, my father made so much effort in having me read that he made sure I got a copy of Harry Potter and the Deathly Hallows on the very first day it was released to the market. Up till today, I still love the 3rd installation of this phenomenal series for some unknown reason. Maybe it's that Harry has finally found someone who loves him or that he had so much to escape from yet everything still boils back down to him. Maybe it's the magical escape of Buckbeak with Harry and Hermoine's time turning feat or maybe it could just be...a personal preference. Either way, it's still the best one among all 7 books and totally hits the spot on "My favourite book" for Day 9 of the 30 Days Challenge. I suddenly sound like a television commercial. My favourite is probably... Harry Potter and the Goblet of Fire (can't decide between the 1st and 4th book, really). XD Probably because it's so thick and there's more to read about, lolololol.